My parents came to visit for the weekend, and on Friday we headed west to Enchanted Rock, a huge lava dome (technically a monadnock or inselberg) out in the Texas Hill Country between Llano and Fredericksburg. 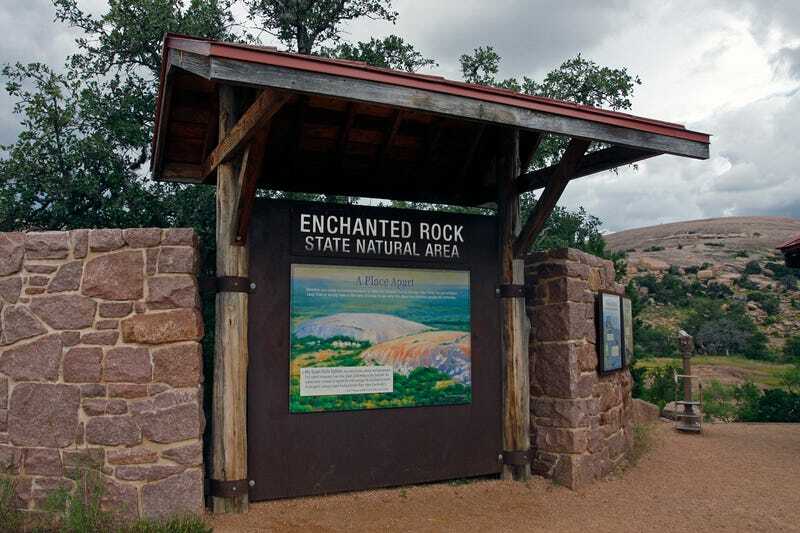 Enchanted Rock gets its name because the native peoples thought it was haunted because it makes noise as it cools at night. On the way there, we stopped in Llano as we crossed the Llano River. Texas has received historic amounts of rain this spring, and the river was higher than we’ve ever seen it. All the rain has also made for an eruption of color on the Rock itself. There are often puddles and tufts of grass and moss up on the Rock, but now there are huge clumps of wildflowers and other greenery that we have never seen before. My father, 76 years old and with only one good eye, on top of the Rock. He’s trekked the world over and climbed Mt. Kilimanajaro, so despite his age and vision, this was a walk in the park. Most photos taken with a Canon 40D and Tamron 17-50 f/2.8 at some setting or another.